Tom Ford Noir Eau de Toilette presents a dynamic new expression of Tom Ford Noir. An olfactory portrait of cool and unstudied confidence that hints at carnal sensuality beneath the surface, it offers a fresh and energised way to wear the Tom Ford Noir signature. Smooth and animalic oriental notes take a secondary role as pure citrus oils and herbal notes come to the forefront, brightened and heightened in their impact. The original fragrance's tension of creamy and fresh notes becomes experienced from a new perspective, as Tom Ford Noir Eau de Toilette captures the sophisticated and compelling masculine duality at the heart of Tom Ford Noir, yet reframes it with splashy, and luxuriously substantive, elegance. The opening effects of dynamic Italian bergamot and verbena, caraway, baie rose and violet flower evoke a brilliant citrus splash with eccentric sparkle. New additions of spearmint oil and a dose of lemon Italy up the ante with dizzying, effervescent essences. The smooth, dry spice accord of black pepper from Madagascar and nutmeg has been re-balanced for an even more ethereal, yet skin gripping and substantive effect. A golden glow comes spilling forth"a warm, living bouquet that seems to draw all air toward it. 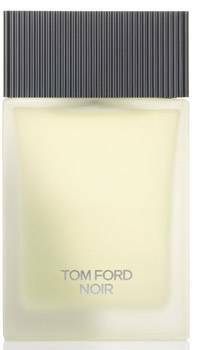 Exceptionally luxuriant Tuscan iris resin, Egyptian geranium, Bulgarian rose, and enriched clary sage lend depth and richness"a core note as masculine as a bare chest beneath a white dress shirt. The introduction of cardamom, a cold and blue-hued spice, outlines this core note's form, giving even more elegance, like late-afternoon light tracing along a marble statue. An amber-drenched woody effect defines the dry down, driven by exotic opoponax, amber, a substantial dose of Indonesian patchouli oil and vetiver oil. The overall effect is that of an enveloping mist. Hypnotic benzoin from Laos and vanilla lend a last creamy caress, while civet adds animalic bite. Experience the sophistication and intrigue of Tom Ford Noir in an intensely rich after shave balm and lightly scented deodorant stick. Pair with Tom Ford Noir EDT or Eau de Parfum for a luxurious portrait of elegance and edge. Tom Ford Noir Eau De Toilette is packaged in the rectangular NOIR bottle, recast in transparent frosted glass to convey the fragrance's lighter feel. The bottle's sides are ribbed and marked with the letter 'T" on one side and 'F" on the other and its rectangular, black cap is ribbed on all sides and features a silver 'TF" logo on the top. The Tom Ford Noir bottle is packaged in a glossy silver metallic carton with side panels in matte silver featuring a frosted 'T" and 'F" and embossed with a black 'TF" logo on the top. Tom Ford Noir Eau De Toilette is available at selected David Jones and MYER stores and online at www.davidjones.com.au.